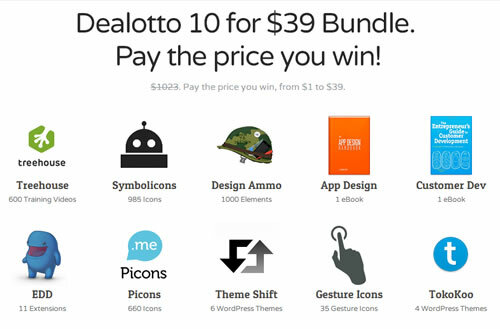 Dealotto are currently hosting their third designer bundle. Over a $1000 worth of content for only $39 or less, fantastic savings for some really good and useful items. If you haven’t heard of Dealotto before it’s a great daily deals website with a difference. The difference being you buy a ticket (from 0-3$) and then enter to win your item at a discounted rate or even for free! Everyone makes a great saving regardless of how lucky they are, but some will save even more. I won the first Dealotto designer bundle for free and have been a fan ever since. Here’s a quick run down of what’s available in the bundle. Feel free to head on over to Dealotto and checkout more information. This is a fantastic deal, the WordPress themes alone are worth a lot more than the maximum $39 you will pay. Please note this bundle is only available for 2 weeks ending on the 6th of November. So I guess the only question left is… are you feeling lucky? Membership is free of charge, so it’s worth signing up even if you don’t fancy this bundle. They’ve always got some cool stuff on offer. Let me know in the comments if you grabbed the bundle and how you will use/used the content, I’d love to take a look.